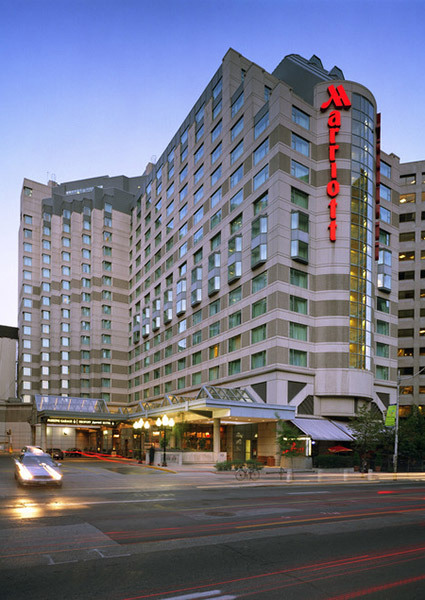 Style and substance blend seamlessly at the Toronto Marriott Downtown Eaton Centre Hotel. Featuring spacious, thoughtfully designed guest rooms, modern amenities, and outstanding service befitting a luxury hotel, we set the stage for a memorable hotel stay in downtown Toronto. Whether you're visiting Toronto for work or for play, our hotel provides everything you need for a pleasant, productive experience. Our hotel rooms and suites feature deluxe bedding, high-speed Wi-Fi, and an ergonomic work area, while our other resources include exceptional on-site dining, a pool, a fitness centre, and almost 20,000 square feet of exquisitely appointed, versatile venue space. Our hotel's prime location in the heart of downtown Toronto's business district allows for easy access to many corporate headquarters and to famous attractions like the CN Tower, Eaton Centre, and the Hockey Hall of Fame.